An email released by WikiLeaks shows how the Democratic Party purposefully "elevated" Trump to "leader of the pack"
Republican Donald Trump, a far-right demagogue who campaigned on a slew of bigoted, xenophobic policies, has won the 2016 presidential election in a shocking victory few people predicted. What was not often acknowledged in Trump's heated race against Democrat Hillary Clinton, however, was how her campaign fueled his rise to power. An email recently released by the whistleblowing organization WikiLeaks shows how the Clinton campaign and Democratic Party bear direct responsibility for propelling the bigoted billionaire to the White House. In its self-described "pied piper" strategy, the Clinton campaign proposed intentionally cultivating extreme right-wing presidential candidates, hoping to turn them into the new "mainstream of the Republican Party" in order to try to increase Clinton's chances of winning. The Clinton campaign and Democratic National Committee called for using far-right candidates "as a cudgel to move the more established candidates further to the right." Clinton's camp insisted that Trump and other extremists should be "elevated" to "leaders of the pack" and media outlets should be told to "take them seriously." The strategy backfired — royally. On April 23, 2015, two weeks after Hillary Clinton officially declared her presidential campaign, her staff sent out a group message with information for a "strategy call." 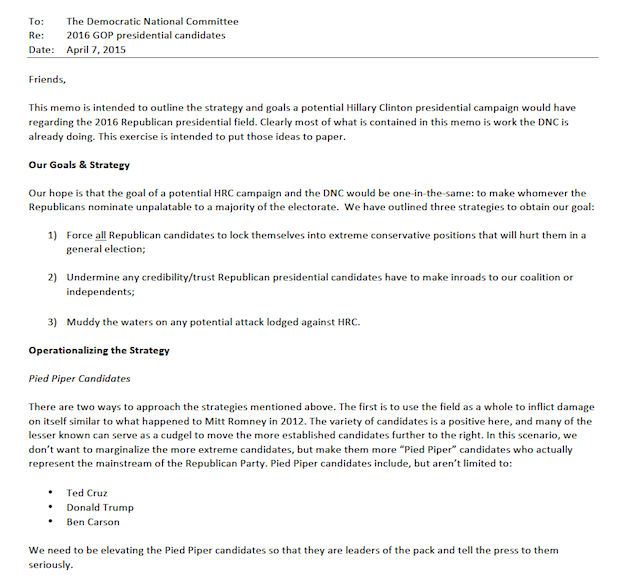 The email included as an attachment a "memo for the DNC discussion." The memo, which was addressed to the Democratic National Committee, outlined "the strategy and goals a potential Hillary Clinton presidential campaign would have regarding the 2016 Republican presidential field." The document stated, "Clearly most of what is contained in this memo is work the DNC is already doing. This exercise is intended to put those ideas to paper." It continued, "Our hope is that the goal of a potential HRC campaign and the DNC would be one-in-the-same: to make whomever the Republicans nominate unpalatable to a majority of the electorate." The memo articulated a three-point strategy. Point 1 called for forcing "all Republican candidates to lock themselves into extreme conservative positions that will hurt them in a general election." At the time, there were more than a dozen Republican presidential candidates. The "variety of candidates is a positive here," the Clinton campaign said. "Many of the lesser known can serve as a cudgel to move the more established candidates further to the right," the memo noted. This document was part of the tens of thousands of emails to and from John Podesta, the chair of Hillary Clinton's presidential campaign, which were released by WikiLeaks. Other messages published by the whistleblowing organization show how, while the Clinton camp was facilitating the rise of Trump, it was systematically undermining the campaign of Sen. Bernie Sanders, Clinton's left-wing opponent. Leaked emails from the Democratic National Committee show that the organization, which is supposed to be bound to impartiality, sabotaged Sanders' insurgent presidential campaign, which had mobilized millions of people and inspired a massive grassroots movement. Sanders, a self-described Democratic socialist, repeatedly warned in the primary that he would have a greater chance of defeating Trump. Poll after poll showed that he would have beaten Trump in the general election by wide margins. Instead, his candidacy was repressed — and now Clinton has lost to Trump. Trump and Clinton were the least popular major-party presidential nominees in U.S. history, according to an August poll. An October report cited Sanders as the most popular political figure in the country.